Stream Camp - Did You Know? We understand summer camp can be expensive and this is why we offer 3 Ways to Pay for STREAM Camp. We heard you! Lunch will be now be offered for $22.50 a week at BOTH Saint Ann and Saint Raphael STREAM Camp locations. A $25 deposit is due to hold your spot is due by April 15th! Sign-up online TODAY! STREAM Camp is non-profit and all proceeds are used hire teaches and to purchase STREAM supplies and Equipment and donated to the schools. Here are some examples of Items purchased for and shared between schools. Please contact us at stream.camp.info@gmail.com if you need further financial assistance. A $25 deposit per week per camper will hold your spot. 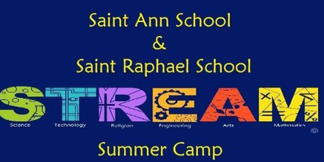 See the Feature Article about STREAM CAMP in the Trenton Monitor! Also, please feel free to reach out to us with any questions, recommendations, concerns or requests by filling out our contact form.